A while back, July 4th in fact, I dinged up my right foot. It turns out that I sprained a toe. Which has had me limping along in shoes that feel one size too small. But that shouldn’t stop one from dressing when one needs to. For our monthly visit to Church, for example. 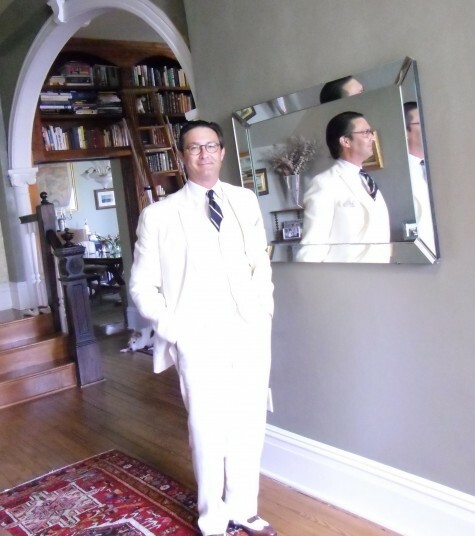 And yes, even in a nave full of seersucker suits and bow ties, I attracted attention. I think it was the shoes. Now the problem with a dinged up foot is that it can betray you. Like when you’re playing catch with a friend and your ancient Little League reflexes come into play. I stopped the ball that came wide right, caught the edge of my foot, dropped over and rolled out of the fall, not exactly unscathed. 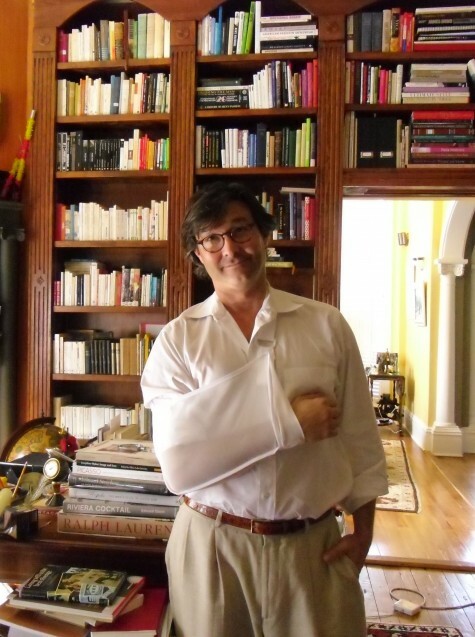 It turns out that there is a ligament that attaches your clavicle to your shoulder, or something like that, that if it’s been strained before — a dislocated shoulder from a fencing bout having been the culprit, say — is much easier to re-damage. Ah well, I notice that my sling is white and very open weave. Which should be fine since I don’t plan on wearing it past Labour Day. I did the same thing-only it was during a hurricane in San Diego night surfing. Wish you a rapid recovery C.C. Chris! I am so sorry – what a pain, literally and figuratively. Wishing you a quick recovery. Wait… you pulled a ligament in your shoulder playing catch in church? You have me re-thinking my denominational choice. Get well soon. Sorry about your accident. Not to laugh at your injury, but I love the look on your face in the second photo. Also love the shoes in the first! Bummy! I knew that you were limping a bit in B-more, especially after I dragged you up and down five floors of the Tremont Grand, but I am shocked about your arm! Best wishes for a speedy recovery!